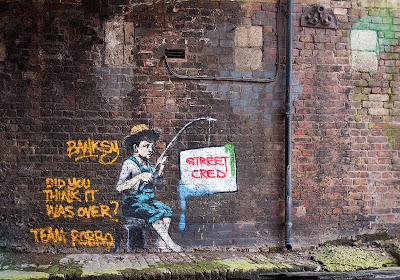 Banksy is back in the headlines. Exit through the cafe Banksy's foray into the mainstream movie world has sparked an interesting debate as critics and the public try and figure out who is having who on here. Just who is Mr Brainwave? What is street cred and who has it. Robbo a local street artist claims Banksy has lost it. Dunno about his statement, but Robbo sure looks very talented too. And the image he uses is Tom Sawyer-Huck Finn-ish, from up the river from here in Hannibal, Missouri. Super-wholesome American fantasy. Perhaps Banksy is assuring us that he remains pure to his art and will not abandon his fans (or enemies). Haha. Funny that you wrote Mr. Brainwave! I love Mr. Brainwash. He is one of my fav. artists!! Search Youtube for 'Mr. Brainwash on Carson Daly' and you'll see why. He has a fantastic exhibit going on in NYC right now. I wish I could go! Is this somewhere along Regents Canal? I've seen something similar along there before.